Centennial Plaza - Close to completion! on Windsor's Riverfront, just east of the Spirit of Windsor locomotive, you'll be amazed at what this plaza has to offer! This is a free event. 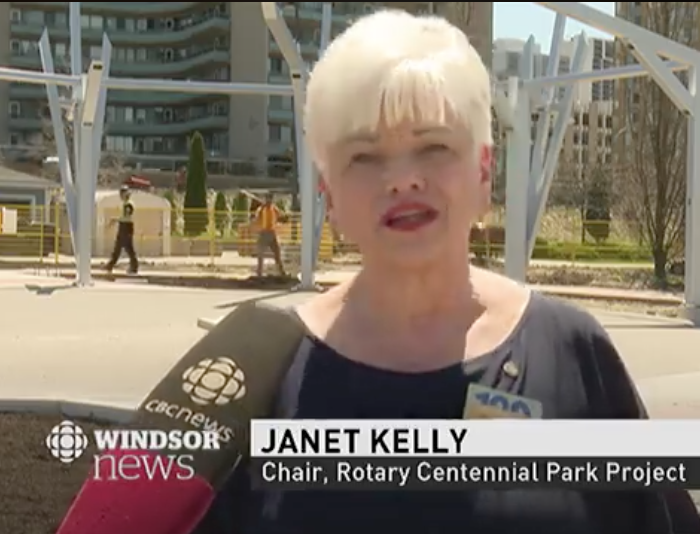 Join us for the Grand Opening of the Rotary Club of Windsor (1918) Centennial Plaza. Rotary Club of Windsor (1918), in partnership with the City of Windsor and sponsored by Heritage Canada, ENWIN Utilities, Canadian Association of Mold Makers and countless others worked to create an absolutely incredible destination on Windsor's beautiful Riverside. Features include lush landscaping, a canopy and trellis, picnic tables, swing benches, informative plaques illustrating the Club's history and the highlight: A unique geodesic light sculpture created by artist/sculptor Nicolas de Cosson and powered by ENWIN. This light feature will display a show of light, and will make the plaza particularly spectacular at night.